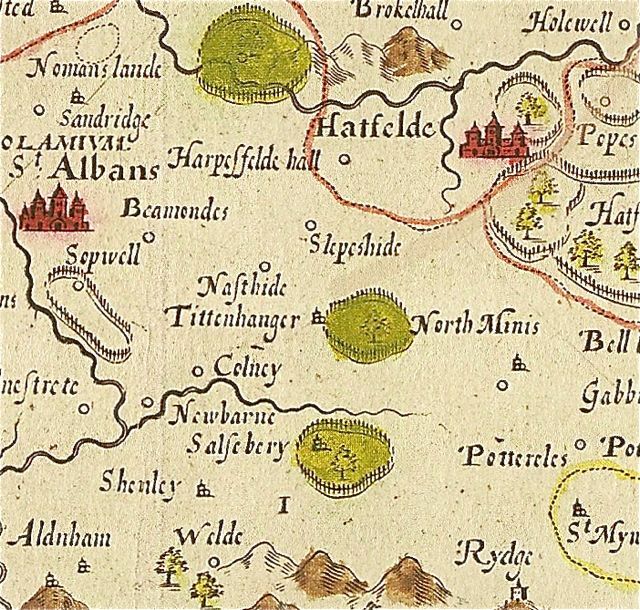 Among the medieval manors which once governed all of life on the east side of St Albans, was Beaumonts. 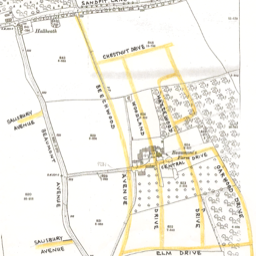 Its jurisdiction probably extended much further than the boundaries of the 19th century farm on which the modern estate – and much of Camp north of Camp Road – have been subsequently built. 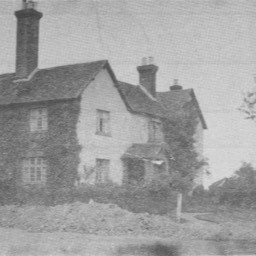 We have no idea what the first manor house looked like. 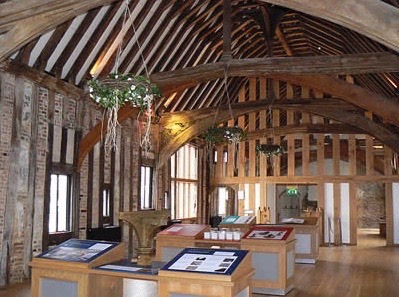 This is Bisham, but it may have been in brick or even timber. The size and style of the first manor house – and its period of build – are pure guesswork. It could have looked similar to any of the above, or none of them. Top: Charlbury; middle: Cobble Court, Ohio, a modern depiction of a French Norman manor house; lower: Dragon Hall, Norwich. 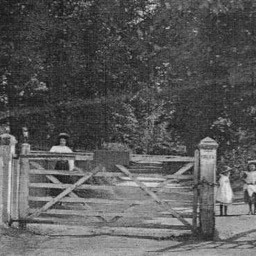 There is now no surviving evidence of the structures of the manor, farm or former estate, other than the cottages at the north end of Beaumont Avenue. 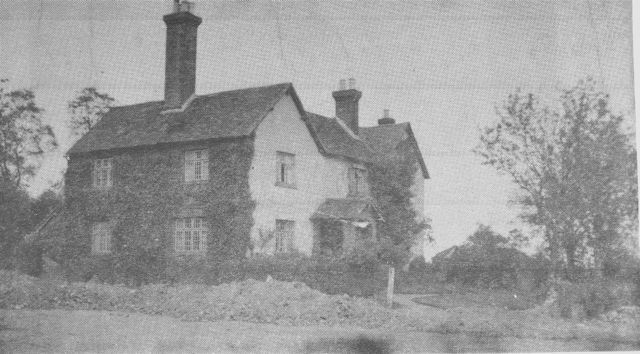 The final obliteration of evidence came in 1938 with preparations for the building of houses in Woodland Drive, when the 1831 farmhouse was demolished. The earliest structure surviving up to that date was the remains of a moat. 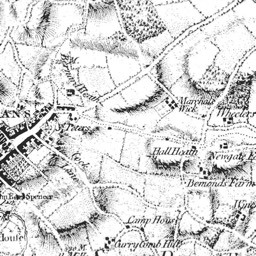 Even on a 19th century Ordnance Survey map the moat, though visible, is clearly incomplete, but photographs taken in the 1930s indicate that what remained was still water-filled and looking like a long tree- and shrub-lined pond or small linear lake. Maybe, with the future of the farm becoming uncertain, in 1909 a report was commissioned by the National Monuments Commission (now Historic England) to investigate the possible historical importance of the moat, within which there was no sign of any surviving building. The moat was rectangular in shape, measuring roughly 24 by 170 feet externally, with the ditch estimated itv 35 feet wide at the surface. Two of its sides lie underneath Central Drive and Woodland Drive south with the entire internal ground surface lying with the curtilage of properties in Woodland Drive south, Hazelwood Drive south, and the south side of Central Drive. 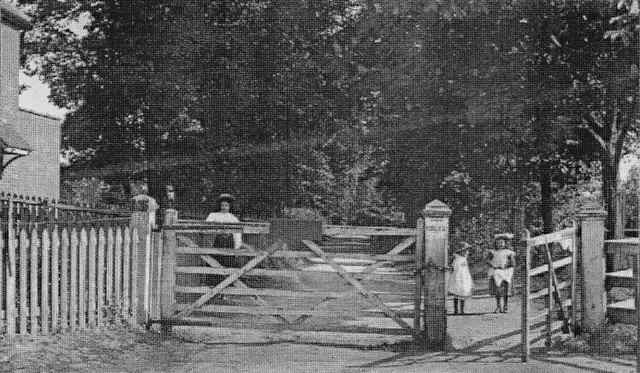 The only moats which are known to have existed and which do not enclose buildings are those which may have stockaded animals, but this is unlikely in the case of Beaumonts as it was not a recognised stock-rearing area. Early buildings may have been protected by a moat for practical defensive reasons. Some later buildings may still have possessed moats, even if the threat of attack had largely disappeared. In these cased they would have been excavated largely for show; as a status symbol. 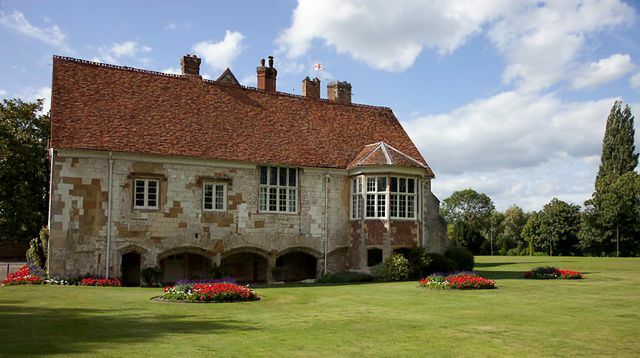 Without the building it is impossible to know into which category Beaumonts Manor fell. But what IS certain is that it would have contained a building, and serious expense would not have been incurred on a building of lower status than the manor itself. 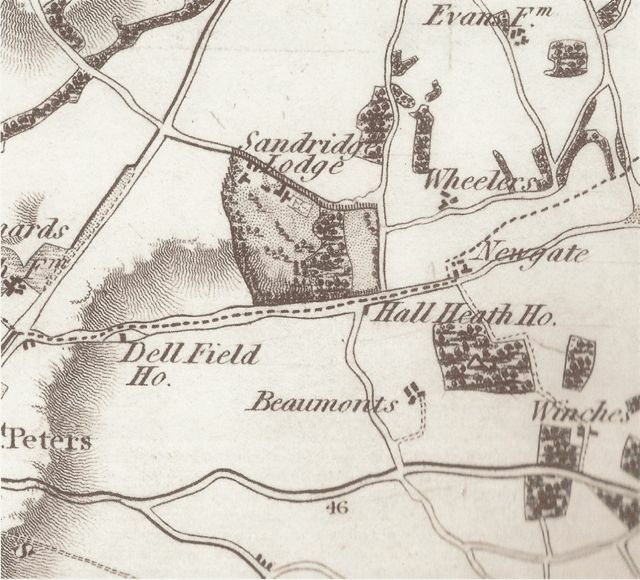 So it seems almost certain that the site of the first manor house at Beaumonts was within the moat to the south of Central Drive. A filled in section on the northern short side may have been for a rather different purpose than the other sections of the moat. A building within a moat presumes there must also have been a drawbridge of some kind, or a permanent walkway across it. A mechanism would have required maintenance, and there may have come a time when this was considered unnecessary, and was replaced by a breach – an infill of earth to provide a pathway between inside and outside. Indeed, this bund may always have been there if the original function of the moat had been ornamental. The opening on the north side is also logical since it was adjacent to the lowest land in this little valley and the track to the outside world – later today's Central Drive Beaumont Avenue. No document so far discovered has mentioned more than one manor, or a manor and a separate farm building. It must therefore be assumed that the moated manor was simply replaced. Any replacement may have been necessitated by the limited size of the moated site and the fact that access was also limited. 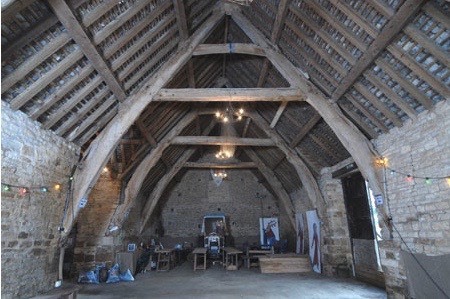 We know nothing about its structure, but presume it to be timber framed with ordinary plaster infills. This was a simple building intended for local control rather than a building of strategic importance over a larger area. Although bricks were in use during the early medieval period, and could have been used at Beaumonts, proof could only come from archaeology, which is now almost impossible to undertake. There arises the question of why the building did not survive to be referred to in later documents and maps. Two obvious reasons come to mind. First, that a catastrophic fire may have made its replacement urgent and inevitable, leaving little behind. Second, timbers – and maybe bricks if used – from the manor may have been transferred to the new site. This having been done the residual work of clearing the moat site would not have been insurmountable, and the restored rectangle would have made a suitable paddock with or without fencing, even though that would not have been its original function. 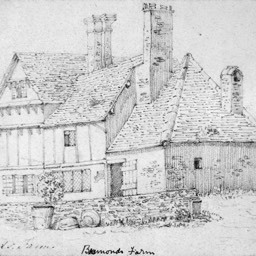 The building which Jane Marten drew in 1828 was probably erected somewhere between 1600 and 1700. 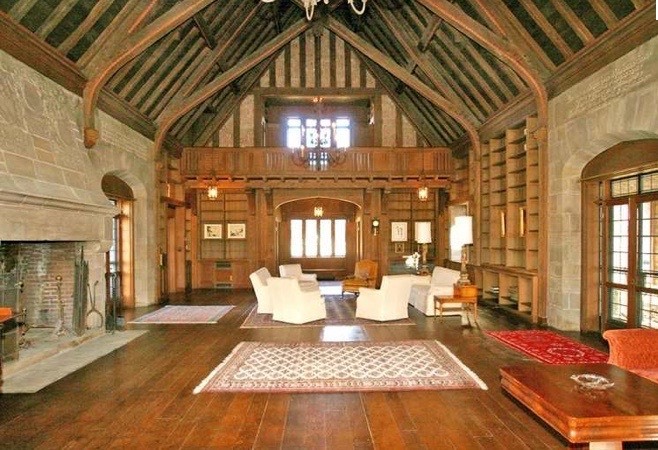 It was typical of late Tudor or Jacobean styles which became popular. Two substantial chimney stacks suggest that heating was widespread through the house, including on the first floor. Small diamond-paned windows are shown throughout, with one of the ground floor windows shuttered. A cantilevered second floor with exposed decorated floor brackets indicate a substantial structure. Exposed beams are at first floor level and the facing appears to be plaster, hiding an internal brick skin. It is therefore possible that bricks were recovered from the first manor building. 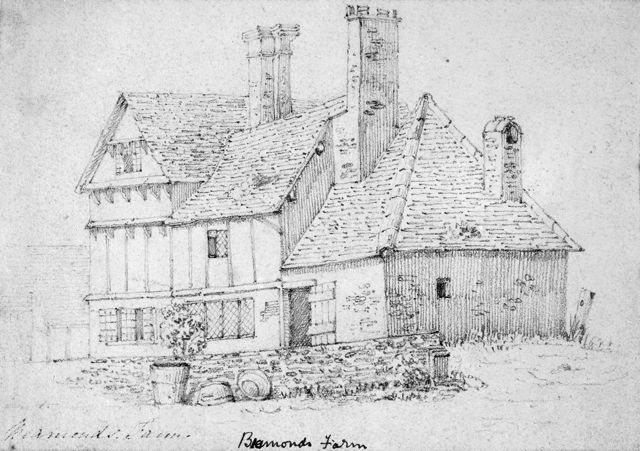 The artist gives an impression of the worn age of the house, which may have been in existence for up to two hundred years at the time of being drawn. This is clearly not the house built for a tenant farmer, but, as with the earlier manor, by its owner. Whether this building was called a manor house or a farm house is a moot point. From around 1750 the house had been owned and lived in by Thomas Kinder, the second husband of Elizabeth Cole. He appeared to be the last owner who lived there. His son, also Thomas, lived at Sandridgebury House. 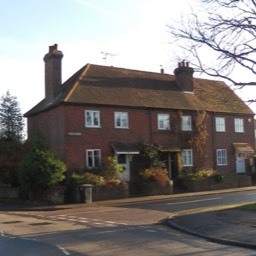 The design of the Victorian farm house is difficult to date, but we must assume a connection with the above-mentioned Thomas not wishing to live in the Jacobean structure as his father had done. The date of the Victorian house is likely to correspond with the date of Thomas senior's death. It must also be presumed that one important reason for Thomas junior's change of domicile was the condition of the old house. His financial circumstances may also have enabled him to live in a more substantial building than his father. Thus the rebuild is in a plainer, smaller style, more suited to tenant occupancy. The new tenant to look after the farm had arrived by 1840: George Pocock and his wife Charlotte. 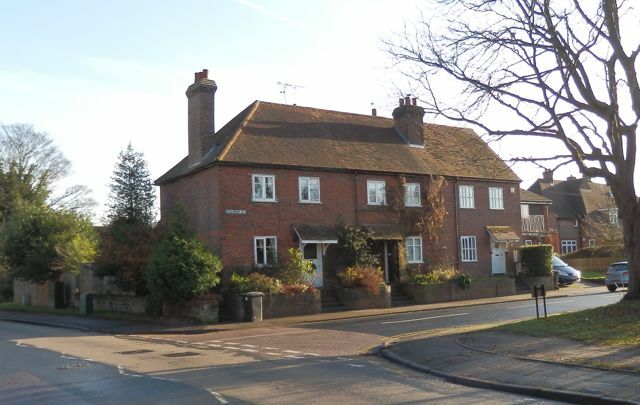 The three labourers cottages at the north end of Beaumont Avenue were constructed shortly before the building of the farm house; as a pair initially, with an additional cottage added later. 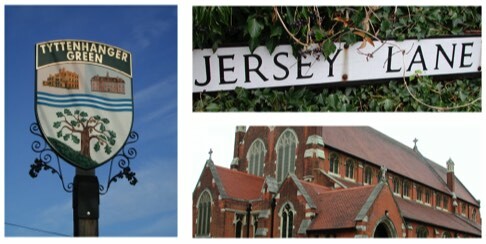 But it is the name of the hamlet in which they are built which is intriguing. This is Hall Heath. 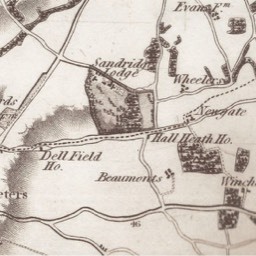 The heath part of the name is clear; between the two hills in Sandpit Lane (one west of The Dell and the other east of Damson Way) was the former upland heath, which describes the natural vegetation which might have been expected before settlement. The Hall part of the name, however, offers us the possibility that this refers to a medieval hall house. 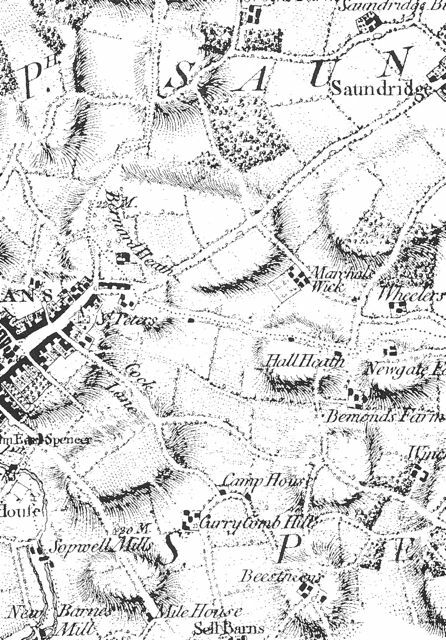 There appears to be no direct evidence but the hall in question was probably an early Beaumonts manorial building. As such there may have been a structure on the site before the earliest 14th century records. 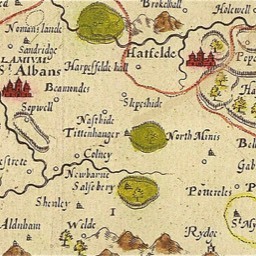 In two nearby locations evidence has been noted of human occupation of the landscape as early as the first century AD: at The Wick, and in Salisbury Avenue. 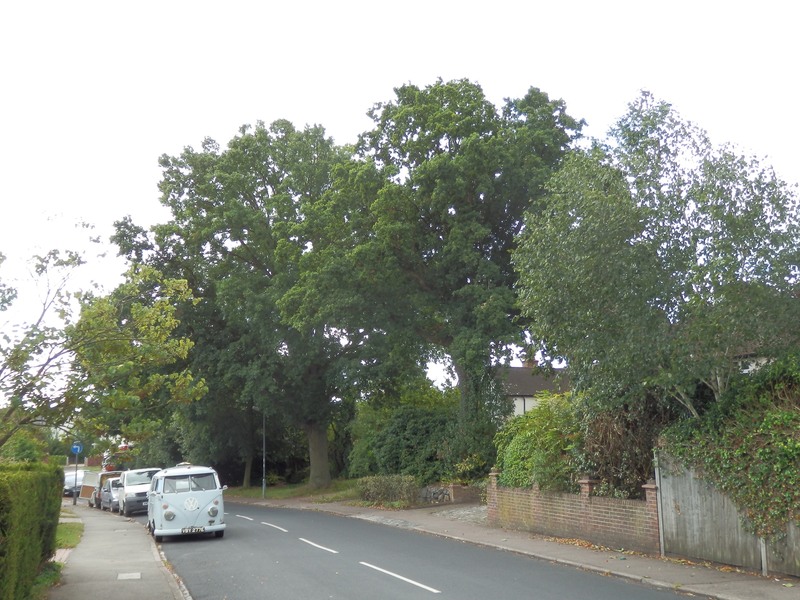 Both are a short distance from a spring and stream which it is thought flowed from the higher ground above The Wick, following the line of Woodstock Road, Eaton Road, Sutton Road and Campfield Road towards the river Ver. 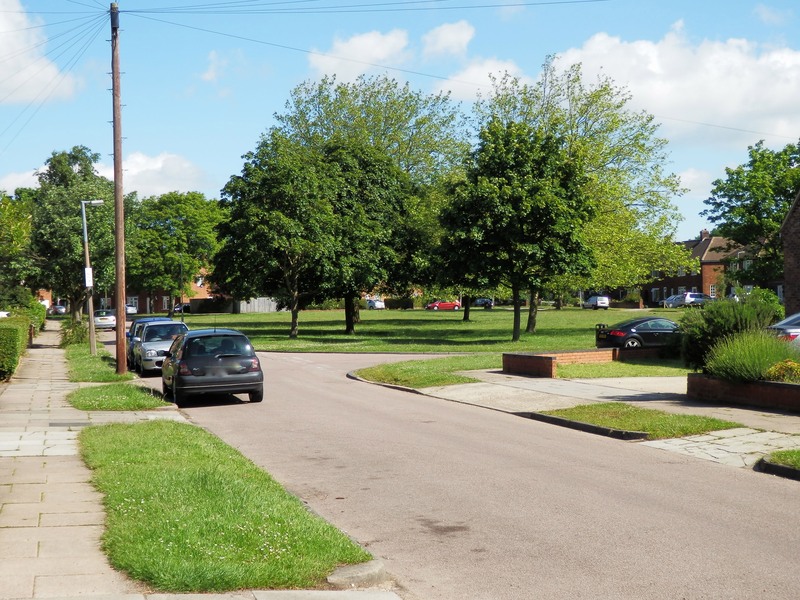 Beaumonts is now significantly smaller than the area of the 19th century farm; the remaining area bounded by Hatfield Road, Beaumont Avenue, Salisbury Avenue, Sandpit Lane and the eastern boundary of Beaumont School. Ignoring here the earliest sale south of Hatfield Road (1899), the earliest development was Salisbury Avenue and the west side of Beaumont Avenue, which was started in 1900. Major expansion occurred from the final sale in 1929, which produced the east side of Beaumont Avenue, plus Beechwood Avenue, Elm Drive, Oakwood Drive and parts of Woodland Drive and Hazelwood Drive. Chestnut Drive and Central Drive, plus the north end of Woodland and Hazelwood drives was completed between 1947 and 1960. 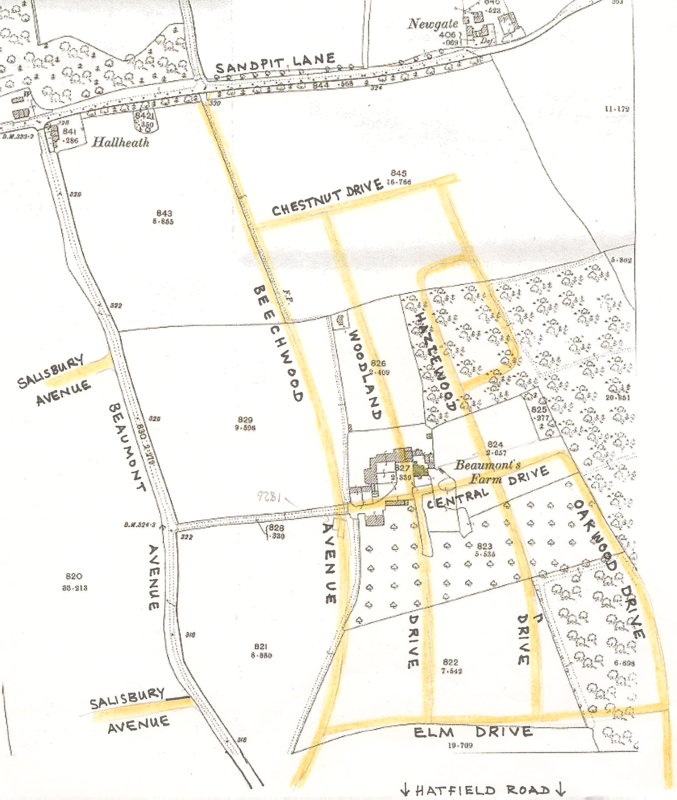 We should not gorget a few in-fill plots after than, including in Farm Road, which is still a privately owned way, usually called Muddy Alley by a generation of children in the 1950s. Triangle at the junction of Salisbury Avenue and Eaton Road. 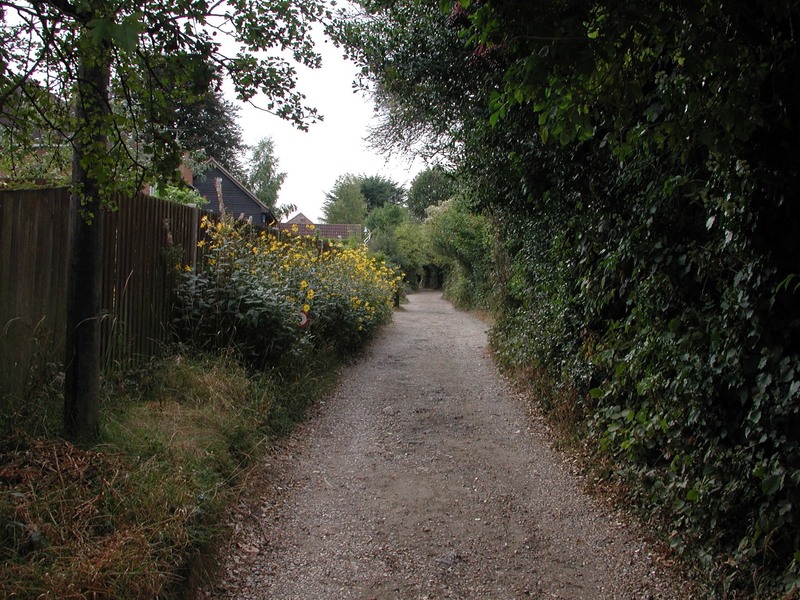 Farm Road, the lane leading to the former farm. 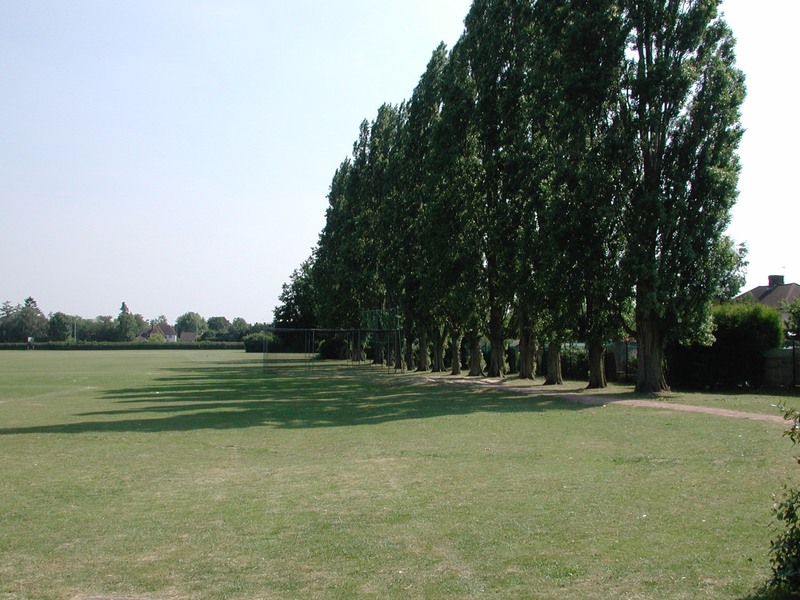 The front field of Beaumont School. Current view of part of Beaumont Avenue. 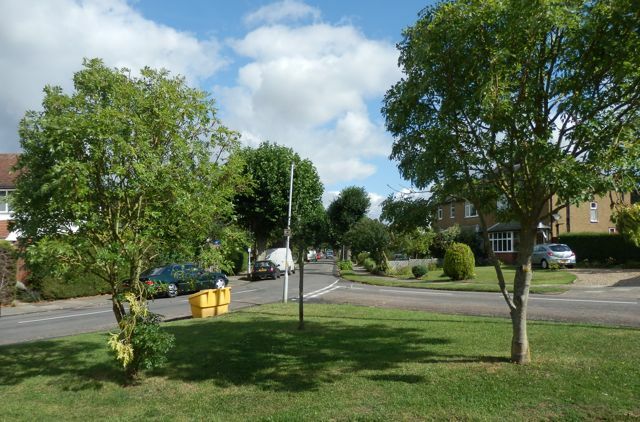 Part of Hazelwood Drive, around the green. A stretch of water shown at Beaumonts Farm looks very much like one arm of a moat with a right-angled turn at a corner. This was a medieval manor and is accepted as a moat fragment by the RCHME. Royal Commission for Historic Monuments England (now Historic England).